Uncle Bobs Club lost one of its long standing and dedicated members when Mr. Ian Hunter passed away on 29th August after a long battle with cancer. Ian joined the Metropolitan Fire Brigade in January 1977, and retired on his 67th birthday as a Commander after 39 years of service to the organisation. Ian joined the Club in 1984, but he was very much involved as a volunteer long before then. A couple of years ago we asked Ian how he first got involved with the Club. Here is what Ian told us at that time …. ”Back in 1975 I was involved in providing some old fire trucks to promote the film “Towering Inferno” for the Moomba Parade. It just so happened that my crew were lined up beside the crew from Carlton fire station, and I met Fred Kerr. One thing led to another and Fred asked if we would come to St Kilda Junction on Good Friday to help collect for Uncle Bobs Club. On Good Friday I met Fred’s brother Jim, who was also a fireman, and the Club’s corner captain, and the rest of the firies and the UBC committee members. And the rest is history. 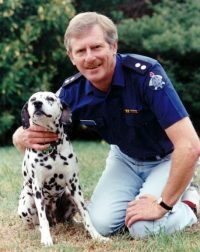 In 1984, Ian took over the Corner Captain duties at St Kilda junction following Jim Kerr’s retirement from the MFB, and served on the Head Office Good Friday Appeal Sub-Committee for many years. Another project that Ian loved being involved in was the Christmas parties for the children at the Uncle Bobs Club Rehabilitation Centre, later to become the Child Development Centre, in Chapman Street, North Melbourne. Ian would arrive at the Club’s office in a vintage fire engine and drive Santa to the centre, help with the distribution of toys, and then drive Santa back to the office. Pictured here is Ian in the fire engine ready to pick up Santa for the 1984 Christmas party. It was a very wet day, and Ian was suitably dressed for the conditions. 	Ian was made an Honorary Life Member of the Club in 1992. 	On Australia Day 1995 Ian was awarded the Australian Fire Service Medal (AFSM) for outstanding service and dedication, particularly in the area of Fire Service training and education in Australia and overseas, and also for his long involvement in the Royal Children’s Hospital Good Friday Appeal. 	Earlier this year the Club decided to award its highest honour, the Meritorious Service Award, to Ian, but sadly he never got to know that he had been so honoured. The Club extends its sincere condolences to Ian’s wife Rhonda, their family and friends, and to all his colleagues at the Melbourne Fire Brigade. Rest in Peace Ian. We will miss you ….